Download "Home Performance Guide Heat Pump Installation"
1 Home Performance Guide Heat Pump Installation Something to fully understand about heat pumps is that they are a part of an overall system, the heating, ventilating and air conditioning (HVAC) system. That system accounts for 35% to 50% of the annual energy consumed by a typical Florida Home (See pie chart). So, when replacing a heat pump, one must anticipate a 25% or less reduction in the overall electric bill depending on the condition and repair of the various parts of the system. Savings above 25% are rare and usually only occur when replacing very inefficient systems and performing duct repairs. In order for the HVAC system to operate at its proper capacity and peak efficiency, all parts of the system must be installed and working correctly. 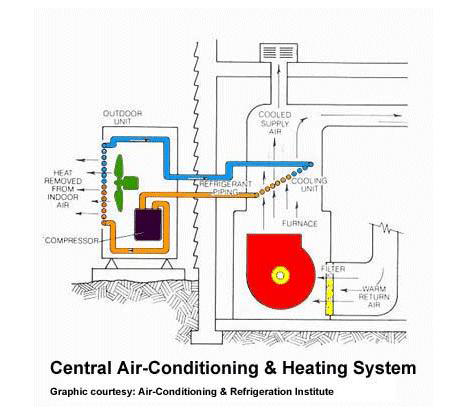 The four parts of a heat pump HVAC system are: 1. The compressor: The outdoor unit (heat exchanger). 2. The air handler: The indoor unit (heat exchanger) and air fan. 3. Refrigerant loop: The amount of refrigerant (refrigerant charge) and the pipes and valves that transport and control the refrigerant to both heat exchangers. 4. The air distribution system: The ductwork and parts of the home that allow the air to flow to and from the air handler. The air handler is also a part of the air distribution system. Chart courtesy of the Florida Solar Energy Center When having a new heat pump installed, most homeowner s feel they will receive full operating efficiency and output by having the equipment replaced. However, depending on the quality of installation and the condition of the duct system, the output and efficiency may be much less than anticipated. A great example is the SEER rating on equipment. Manufacturers label their equipment based on all parts of the system operating perfectly. If you install a SEER 15 heat pump on an old leaky duct system, it will not operate at a SEER 15 level of efficiency. That is why many times the cheapest replacement option may not be the most cost effective way to go when replacing a heat pump. The heat pump installation checklist is designed to address the key factors that affect this system output and efficiency. It is only a guide. When retrofitting an existing home, sometimes budgets, accessibility to parts of the system or other factors may limit the ability to install the system at full capacity and efficiency. The checklist is NOT a guarantee of quality or performance but a best practices guide to ensure these items have been addressed by the technician and understood by the homeowner. 2 Terminologies: Equipment model numbers: The two main pieces of equipment, the compressor and air handler, are designed to work together by the manufacturer. By knowing the model numbers of these two pieces of equipment, one can look at manufacturer s data to see if they were designed to work together, the designed capacity of the equipment and the manufacturers SEER and HSPF ratings. Capacity: Heat pumps are designed to both heat and cool homes through a refrigerant cycle. The capacity refers to the amount of heating and cooling the equipment can provide. They are labeled in British Thermal Units (BTUs) Per Hour. 12,000 BTU s per hour is one ton of heating or cooling capacity. So, a 3 ton unit has the ability to move 36,000 BTU s of energy every hour (in a perfectly installed system). That capacity is based on indoor and outdoor temperatures and can vary throughout the year. During extreme cold conditions the heating capacity of the heat pump can be cut nearly in half and extra heat energy must be added. This is done with heat strips which come on to supplement the heat output of the refrigerant cycle. Heat strips are very inefficient and are the culprits to high winter electric bills. Heat pumps not only heat and cool but dehumidify as well. Another aspect of capacity that is considered when choosing a heat pump is called latent capacity or the ability for the heat pump to remove moisture from the air. This helps maintain proper humidity levels in the home and is a major factor in occupant comfort. Sizing: To properly size equipment for a home, the heating and cooling load required for that home must be known. HVAC contractors and Energy Auditors perform what is known as an ACCA Manual J Load Calculation which determines the amount of heating and cooling load on a home based on many factors such as: size of the home, types of windows, doors and walls, the amount of insulation in walls, attics and floors, how leaky the home is, etc. Once that load is determined, a properly sized HVAC system can be installed. If the manual J load calculation shows the home will have 38,000 BTUs per hour of load, the contractor will choose a system that is sized accordingly. For that home they will most likely choose a 3.5 ton system which is 42,000 BTUs per hour of capacity. If a 5 ton system is installed, the electric bill will be unnecessarily higher and the home may not function as well as it should in the areas of indoor air quality and comfort. If replacing an existing system, a manual J load calculation may be a good idea if you have performed upgrades to the home to make it more efficient (windows, insulation, etc.) since the last HVAC system was installed or if you just want to know what size is best suited for the home. Manual J load calculations can take a couple hours to do properly and may cost a few hundred dollars, but can be well worth it in the long run when it comes to electric costs and the comfort levels in the home. If no improvements have been made and the existing system seemed to work well, replacing the existing system with a new system of the same size should not be a problem.. SEER and HSPF ratings: SEER stands for Seasonal Energy Efficiency Ratio and is a ratio of cooling output for every watt of electrical input. A 10 SEER unit can produce 10 BTUs of cooling for every watt of electrical input. A 15 SEER unit can produce 15 BTUs of cooling for every watt of input. The higher the SEER rating, the more efficient the equipment is. SEER is an average of the equipment s efficiency throughout the cooling season. HSPF stands for Heating Seasonal Performance Factor and is a ratio of heating output for every watt of electrical input. It works the same as SEER but has lower values. A SEER 15 heat pump will typically have an HSPF rating of 8.1 to 8.5. HSPF is an average of the equipment s efficiency throughout the heating season. It is lower since outdoor temperatures are much more extreme during the shorter heating season. Mastic: Mastic is a spreadable putty-type material used for permanently sealing the joints and seams of sheet metal air ducts and/or connections with flexiduct. Mastic is important because it permanently seals the ducts and won t break down over time like duct tape. 5 possible. Over or under charging a refrigerant loop can quickly decrease system efficiency and/or cause premature damage to the equipment. NOTE: If outdoor temperature is below 60 degrees, it is recommended that a technician return and verify/adjust the refrigerant charge when temperatures are above 60 degrees. Motor and fan amperage readings: These readings will indicate whether or not they are operating properly per the manufacturers specifications. Supply air temperature with auxiliary heat and electric heat amps: Heat pumps lose capacity as outdoor temperatures drop. In order to provide heating during extremely cold conditions for our climate zone, they have electric heat strips to add heat for the short time periods it may be needed. Many times a system is installed during the cooling season and heat strips are not tested or used for a long time. Testing them at startup ensures they work so that problems are not discovered many months later on a cold winter night. Section 7: Post Installation Diagnostics All ducts associated with the replaced HVAC equipment were tested to less than 10% leakage to outside (optional): Florida code requires that all ducts be sealed during a heat pump replacement. The ducts should be tested to achieve less than 10% duct leakage to the outside of the conditioned envelope. A Duct test report should be filled out and submitted. A test and balance of the system was performed for delivered BTU output (optional): A special testing procedure called a test and balance determines the delivered BTU s of the system to the home and ensures the system is operating at peak capacity and efficiency. This testing takes specialized equipment and has an extra cost but can be worth it, so it is an optional measure left to the discretion of the homeowner. Talk with the contractor about this test and your options. Section 8: Homeowner Orientation This section is a reminder for the technician to review the checklist with the homeowner and explain key maintenance issues for the equipment, how to properly operate the thermostat, and how to shut power off to the equipment. Homeowner operation and maintenance is a critical part in reducing the energy consumed by the HVAC system and ensuring the equipment works properly for many, many years. RosevilleProject. LoE _ 2 Glass Products. You can reduce your cooling energy usage by 25% or more. Here is the proof. Success with 2015 IECC Northeast & Mid-Atlantic Checklist for Builders & Trades COPYRIGHT 2015 ADVANCED ENERGY. ALL RIGHTS RESERVED TEMPLATE 2015.1.0 PAGE 1 CHECKLIST: JOB READY 1. 2. 3. 4. 5. 6. 7. 8. SUCCESS WITH 2012 IECC DELAWARE Recommended Practices for Optimized Energy Savings for Builders & Trades COPYRIGHT 2015 ADVANCED ENERGY. ALL RIGHTS RESERVED VERSION 2015.1.0 CHECKLIST: JOB READY 1. 2. This permit does not include replacement or upgrading of the existing electrical panel or service (a separate electrical permit must be obtained). 2014 British Columbia Building Code Changes A City of Kelowna interpretation of the 2014 Building Code 9.32 Ventilation changes The following changes reflect the most notable revisions and staff interpretations. Page 1 UNDERSTANDING AND USING THE HVAC DESIGN REVIEW FORM Each of the 38 points of requested information is discussed, and references to the supporting manual are given to substantiate the requirement.